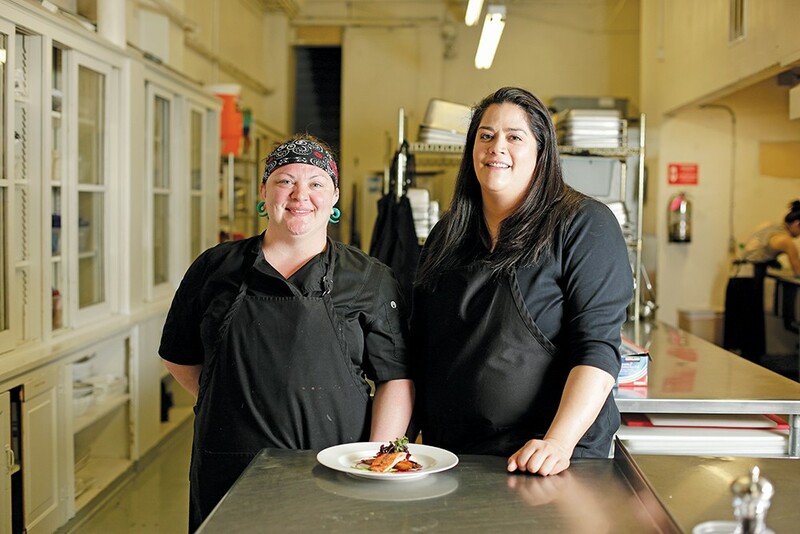 Executive chef Jennifer Parkinson collaborates with London Harris (right), owner of London's Ultimate Catering. London's Ultimate Catering owner London Harris figures they do more than 200 events every year — weddings, corporate events, charity functions — especially during their busiest time from July to January. "We seem to be the 'go-to' special events caterer vs. the everyday caterer," she says. "Most of that is because we take on all aspects of the event in terms of service: planning, design, setup, take down; professional staff with innovative stations and menus." Notable events, says Harris, include the Northwest Museum of Arts and Culture gala; a 10th anniversary black-tie gala at the Fox for 275 guests; a three-day lakeview wedding in Sandpoint with 200 guests each day; and a regular gig with Schweitzer Engineering that has the catering team on the road to Pullman to serve lunch to 1,000 employees. Harris is dedicated to making any size event a success, but admits to a fondness for smaller events with around 50-75 people. "This allows us to get our chef hats out and have fun with the menu and plating ideas." In addition to executive chef Jennifer Parkinson, London's employs four full-time and five part-time staff and up to 30 additional employees during the busiest times. London's also works with numerous venues, such as Patsy Clark Mansion, as their preferred caterer, and frequently collaborates with event planner Jaime Johnson to manage all the details of complicated productions, from florists and photographers, to coordinating technology and entertainment. 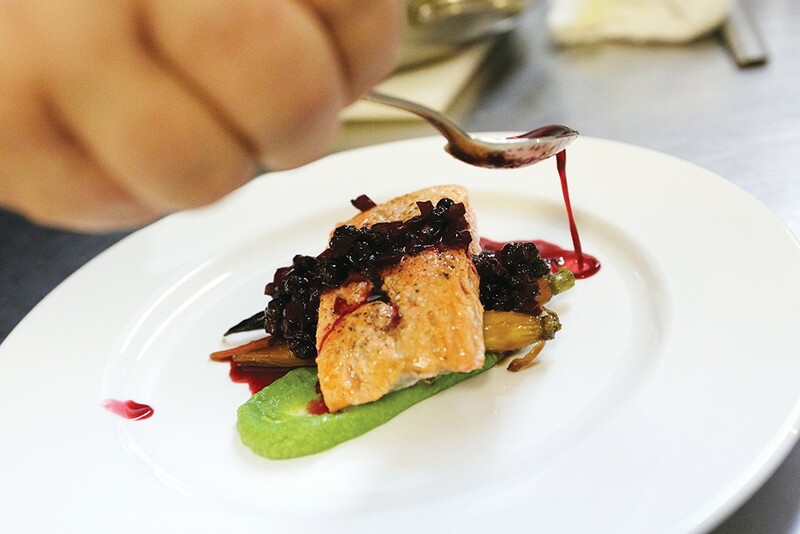 Chef Jennifer Parkinson carefully plates salmon with huckleberry chutney. "I come from the banking industry not the hospitality industry," says Harris, a Gonzaga University graduate who started her catering company at age 35. "Catering is expensive and we want to be good stewards of our clients' money." Like many in the food industry, London's Catering has adapted to the inevitability of special dietary requests. "We are very sensitive to this because we have a few team members with dietary issues," says Harris, who adds that their from-scratch approach allows them to easily adapt what they're making as needed. Also like many in the food industry, they source local products where possible. This year, says Harris, they'll be working with LINC Foods cooperative, which does the local sourcing for them. To maintain the highest standards, rather than simply transporting hot food to a party, London's preps food in their kitchen but finishes it on site, a process that is much more complex — requiring hauling grills, ovens and fryers and the use of refrigerated trailers. "This ensures that the food is served at its peak and not sitting on platters for hours," Harris says. Besides making the most of a food budget, Harris also believes in paying a living wage — so her employees start at $20 an hour, plus health insurance and vacation pay for eligible employees. "We have built an awesome team of event professionals from the kitchen, servers, to the bar with most employees being with us for five plus years. Our team has become our family. We rely on them to execute events, but we also want them to succeed in their life outside of work." In saute pan, dissolve sugar in champagne vinegar. Add diced red onion, lemon zest and mustard seeds and simmer in pan for four minutes. Remove from heat and add huckleberries, chili flakes, cilantro and thyme. Mix and let cool. Can be made three days in advance. Bring pot of water to boil. Add salt, mint and peas and cook for three minutes. While peas are cooking, wrap a small sheet pan with Saran wrap. Drain peas, reserving a quarter of cooking liquid. Puree peas, mint and cooking liquid in blender until smooth. Strain puree through fine mesh sieve. Place puree on sheet pan on top of the Saran wrap to cool as fast as possible so it doesn't turn brown. Can be made up to six hours ahead. Melt butter in large saute pan. Add rinsed carrots and saute with brown sugar for three minutes on medium high heat. Transfer pan to oven and cook for five minutes more until carrots caramelize. Rinse and dry salmon; season one side with salt and pepper. Add olive oil to large saute pan set to medium high heat. Once pan is hot add salmon, seasoned side down and cook for three minutes or until it is nicely seared and brown. Season top side of salmon, flip and saute for one minute for medium rare. Remove salmon from pan to rest. Place two large spoonfuls of pea puree in the middle of the plate. 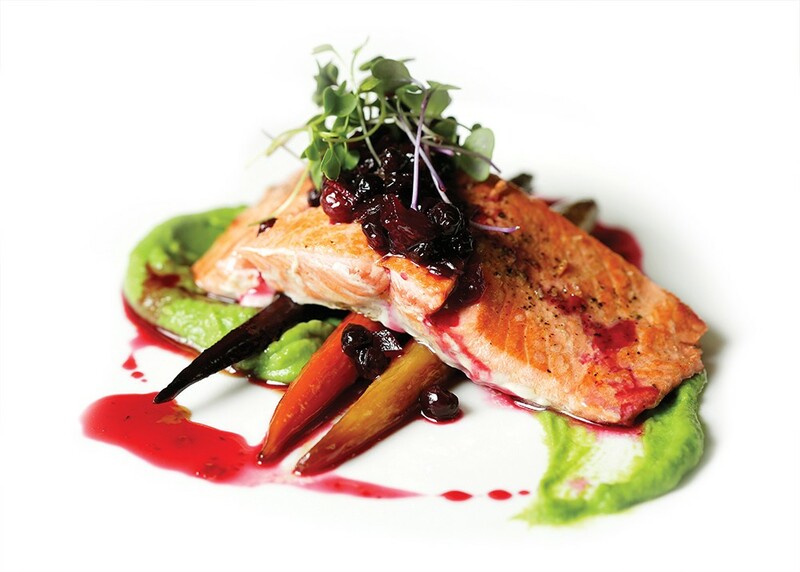 Place three rainbow carrots on top of pea puree, then salmon. Top with huckleberry chutney.